The reasons why the Electro Breeze polarized media commercial air cleaners work so much better compared to other media air filters is because they take advantage of three scientific filtration principles combined in one product to filter air and trap unwanted and harmful particulate. These principles also apply to the only other competitor in polarized media, the Dynamic commercial air cleaner. Eco-friendly building means lower energy usage, less waste produced, less bulk of consumables, less maintenance, higher efficiency filtration for better indoor air quality, so when your plans call for eco-friendly building, Electro-Breeze is the answer. 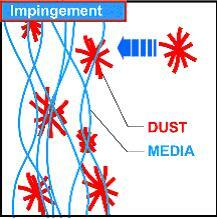 Impingement is the process that all media filters use to trap dust. Simply stated, in order to trap particles the impingement process relies on media being placed in the path of oncoming airborne particles and striking the particles as they flow by in an effort to stop it. The degree of effectiveness of this method depends on the amount of material contained in the media filter placed in the path of the oncoming airborne particulate. Impingement type filters always have a built-in compromise between airflow and efficiency. The greater the efficiency of the filter, the lower the volume of air that is filtered. The greater the flow of air the lower the efficiency except in the case of Electro Breeze electronic air filters, which incorporate polarization and agglomeration to trap particulate. Electro Breezes unique induced polarized media commercial air cleaners are the exception to this principle. Electro Breeze air cleaners are not subject to compromise between airflow and high efficiency, and they meet all the demands for increased airflow and high efficiency. The second major scientific principle used in engineering Electro Breeze air cleaner is polarization. Just like charging a nail to make it into a magnet, the filter media is charged and becomes a dust magnet. With tens of thousands of charged fiber strands in each filter the efficiency of this polarized process is greatly enhanced. In addition, as each particle attaches itself to the fiber strands it in turn becomes part of the collection process thereby increasing the effectiveness of the filter as it loads. 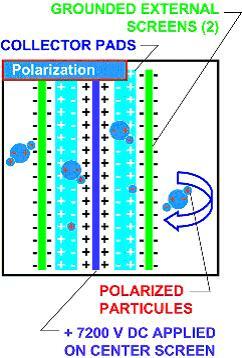 Any particles that may escape through the influence of the polarized filter media travel through the system without any residual charge and are then filtered out on subsequent passes. These magnetized particles can attach themselves to the charged fiber strands in the filter. 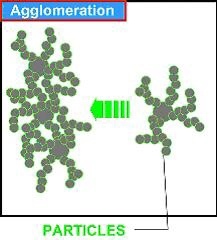 These larger (Agglomerated) particles can become attached to the fiber filter strands. The particles may pass through the filter and AGGLOMERATE and be captured on subsequent passes. The combination of induced electrostatic polarization along with the process of agglomeration results in filtration that compares with clean room standards. A HEPA air cleaner filter can, by definition, remove at least 99.97% of 0.3-micron particles. The Electro Breeze polarized media commercial air cleaner initially eliminates 97% down to 0.3-micron particles then gets more efficient as it loads! What is a micron? Typically, whenever you add higher filtration performance to your air handling system, you will increase your pressure drop and draw more energy. The result is higher utility bills because your system is working harder to deliver the air. The Electro Breeze air cleaner technology allows you to get all this performance without losing airflow. That is eco-friendly building! Compare performance and efficiency with the Dynamic commercial air cleaner.